A basic understanding of some major plant processes will help you understand the causes behind specific growth problems, and what precautions can be taken to solve them. Importantly, if carbon dioxide, water or light energy are in limited supply, then photosynthesis will be restricted. The end result is a reduction in growth due to insufficient sugars being available for respiration. 1. Restricted carbon dioxide supply due to poor ventilation. 2. Restricted light supply due to inadequate lighting or overcrowded foliage. 3. Insufficient water supply due to poor system design or nutrient management. 1. Growth in buds, shoots, root hairs and root tips. 3. Movement of sugars into the phloem for distribution to other areas of the plant. Respiration occurs in 'mitochondria', a component of all plant cells. These are very concentrated in the areas of the most active growth. 1. Insufficient new root growth. See section on ‘roots’. 2. Insufficient oxygen in the nutrient solution due to inadequate aeration. Photorespiration: This occurs when plants are subjected to excessive heat and light - specifically when the temperature exceeds ~35OC (95OF). In this process plants burn sugars without converting them into ATP. Depending upon how much sugar is wasted, this causes plant growth to slow or even cease. 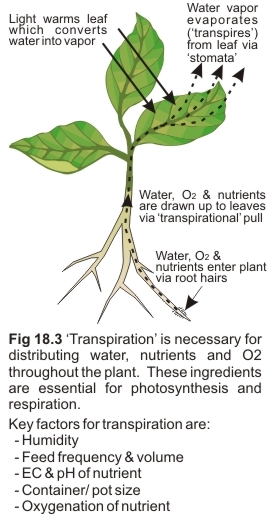 Transpiration is the process of water evaporating from a plant. This loss of water effectively draws water, nutrients and oxygen from the growing medium and distributes them throughout the plant. These ingredients are essential for photosynthesis and respiration. Transpiration mostly occurs through the leaves. As the leaf warms during the day, water is converted into vapour which then diffuses into the atmosphere via the leaf’s stomata. Most of the energy absorbed from sunlight is used to warm up the leaf for transpiration – less than 5% is used for photosynthesis. Most of the water absorbed by plants is transpired. The remainder is used as a reagent in photosynthesis, in keeping cells turgid (or hydrated), and in enabling various chemical reactions to occur. Causes of excessive rates of transpiration are very bright light, high temperatures and strong winds.